I often feel like I'm running for my life. Being active makes me feel like I am fighting my illness, taking a deliberate action to improve my health and combat the symptoms I feel as a lupus, fibromyalgia, hashimotos, osteoporosis fighter. For me Lupus is a constant battle of joint pain, exhaustion, viruses and sometimes a bright facial rash. I'm lucky it has yet to affect my organs. When I was originally diagnosed I was looking at wheelchairs because I couldn't walk unassisted. Now with treatments I run - and I'm so grateful every day I can be active and don't have any plans to slow down. With this fundraising event I am making my mark on the overarching illness of all my health issues - Lupus! Join me and support the mission of the Lupus Foundation of America! My goal is to raise critical funds for the estimated 1.5 million people living with lupus in the United States. Your donation will help me reach my personal fundraising goal and support the Foundation's efforts to improve the quality of life for all people affected by lupus! Lupus is a complex disease that is hard to define. It strikes without warning, affects each person differently, and has no known causes or cure. While lupus mainly affects women between the ages of 15-44, men and children are not spared. Only one drug has ever been developed and approved by the US Food and Drug Administration specifically to treat lupus. 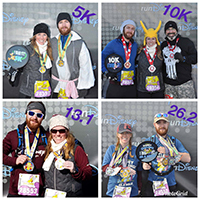 After finishing the Dopey Challenge at Walt Disney World Marathon weekend - a total of 48.6 miles this January I’ve been excited to plan my race calendar for the rest of the year! My goal is to run my second marathon at the Richmond Anthem Marathon. There may be a couple of races in between. Follow my training and treatments on instagram @shapeupstasia or on my blog at fit4abetterlife.com. Let's end this cycle now! By making a donation today you are joining the fight against lupus! Thank you so much for your support and donation!